What do you do if you’ve been fighting with the same people for 20 years? If you’re Nintendo, you hand out some weapons, get an announcer, and invite your friends over to watch. It turns out, quite a lot happens. In celebration of 20 years of booms, zaps, and bonks, we’re taking you through each of the five entries in the series, plus the game’s humble beginnings, discussing in turn what made each era special in route to the series’ ultimate entry. 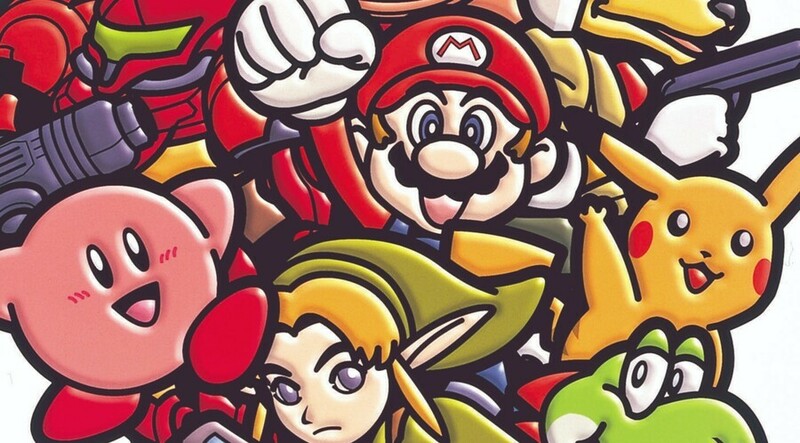 Did you know that Super Smash Bros. is a video game inspired by marbles? 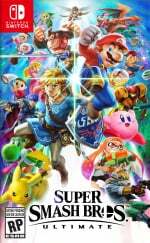 Far more precisely, it is actually the traditional Japanese game Ohajiki that lifelong series director Masahiro Sakurai and the former, late president of Nintendo, Satoru Iwata, based the gameplay of their collaboration on. This core concept would eventually evolve into Super Smash Bros. 64, the very first game in the series. 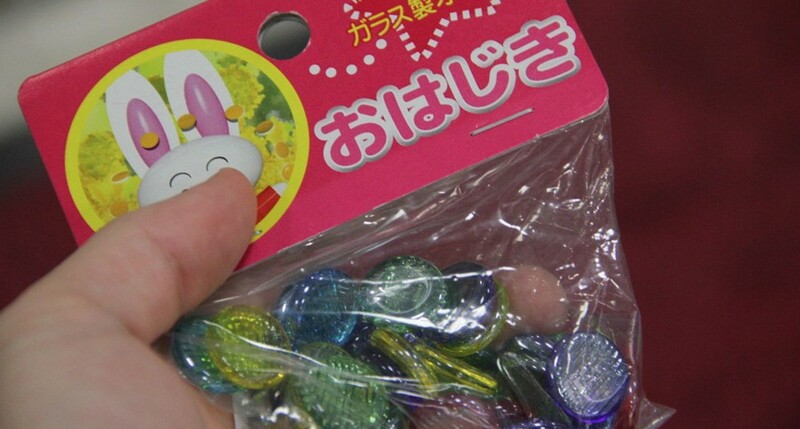 If you aren’t familiar with it, Ohajiki is typically played with flat, colourful discs on a flat surface. The game has seemingly as many rulesets as there are children who play it, but the rules usually involve flicking the discs between other discs, hitting or not hitting certain discs, and, yes, hitting a disc outside of a boundary. The story of how this idea of disc-flicking turned into a digital fighter has been told on various Japanese web pages (a refreshingly transparent tradition that Nintendo has continued and evolved for this series), as well as in Sakurai’s own book about game design. The Smash Bros. origin story goes like this: Sakurai, originator of the popular Kirby video game franchise while employed at gaming studio HAL Laboratory, went through his routine paces by submitting projects for Nintendo’s latest home console, the Nintendo 64. Through a series of financial decisions, the least ambitious of his submitted projects would eventually be sped ahead of schedule to fill in the holiday 1998 timeslot (the final product would actually be released early 1999). The reasoning to go with a smaller project? It was a fighting game concept, which meant it could theoretically come together much more quickly than his other chosen genres. As it was initially a low priority, Sakurai wound up single-handedly designing almost every element of the game himself, while Iwata handled all of the coding by himself, too. The result? Dragon King: The Fighting Game. Of course, nobody has ever played Dragon King: The Fighting Game, because Sakurai correctly assumed nobody would intrinsically want to play Dragon King: The Fighting Game. Having developed the core foundation for the title: double jumps, shields, on-screen percentages that inform how far a character will fly when hit, and a 4-player battle royal mode, Sakurai and Iwata covertly continued development of their game, some say, well beyond the point of no return. Then they put Nintendo character skins over all the characters. For this, Iwata and Sakurai were said to have been “put through the ringer” by Nintendo, and even some fans. Mario punching Fox? Pikachu zapping Yoshi? Madness. There was just one major problem for its heady detractors: the game was way too fun. Following a concession by Nintendo and a rapid development cycle relative to a major first-party title, the Super Smash Bros. series was officially born, Nintendo characters and all. What does a fighting game look like? Up until the late 1990s, and largely still, fighting games are mostly a product of what big, honking arcade controllers look like. Largely unchanged for decades, they pretty all had a big stick and between four to six buttons. But what do you do when the fighting game you’re making is controlled with the N64 pad, arguably one of the most unusual controllers ever made? Video game historians often point out the direct line between original 3D Nintendo titles, such as Super Mario 64, Mario Kart 64, and Zelda: Ocarina of Time, and the plastic controller that was holistically designed to play them. But maybe more impressive is the manner by which series director Masahiro Sakurai backwards-engineered a simple way to play fighting games using that same, bizarre controller. Gone were the complicated button sequences, or “combos” that fighting game series like Tekken, Street Fighter and Mortal Kombat are known for. In Smash Bros., every single character plays totally uniquely but is controlled in exactly the same way. Further bucking genre conventions, no character has a health bar to deplete. Instead, the goal is simply to stay on the stage any way you can while knocking the other person off. Want to jump? Push up. Need to defend? Even the person in the back of the room can tell you’re blocking; a giant, colourful orb covers your body when you block. Smart, given the screen often has to zoom out to show up to 4 players at once. 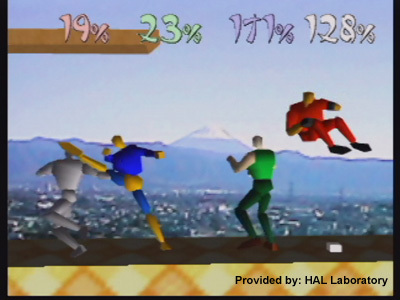 As the forefather of the series, Super Smash Bros. 64 is a cartridge brimming with intelligent design. And like all smart designs, you hardly notice it. It’s hard to absorb design decisions when Donkey Kong is winding up to punch you from behind and Pikachu is calling down thunder from above. Spicing up the formula even further are randomly-generated items on the playing field – many hailing from Nintendo franchises – that act as power-ups to whoever can catch them first. Then there are the loud cartoon sound effects punctuated by a literal, invisible audience that cheers and claps as you rumble. Rounding out the stuffed cartridge are mini-game and arcade-style single player options, and even a moveable camera mode that doubled as the pause button. Clever. Even when you closed your eyes and imagined it, who knew Mario and Link fighting each other could honestly be this fun? Super Smash Bros. 64 went on to sell five and a half million copies, and was the fifth best selling game in the N64’s history. Encore! After the runaway success of Smash 64, Nintendo no longer needed convincing turning the game into a franchise, yet things were quickly changing in the video game marketplace. In 2001, Nintendo ushered in the successor to the Nintendo 64, the Nintendo GameCube. Almost everything about this hardware, outside of its oddball purple colour, was a response to the building criticism of Nintendo remaining too old-fashioned; it had CD technology, edgy marketing and even the strongest processing speed on the market. Also unconventionally Nintendo? The Nintendo GameCube did not launch with a flagship Mario title, nor even a Zelda title. Instead, Super Smash Bros. Melee launched the week of the console’s premier, taking over the mantle as Nintendo’s marquee thoroughbred. And boy, did it look the part. In fact, many still take for granted just how strongly Nintendo crushed it with this sequel. Heck, even the game’s opening title screen is so cinematically over the top, it plays like 6 years of frustration from technologically lagging behind the Sony PlayStation, all gushing out simultaneously into one minute-and-a-half long video. At its roots, Super Smash Bros. Melee was the original game on steroids; it featured 26 characters, more than double of the original’s 12; it utilized a far more advanced game engine; it had way more items and stages and deeply robust menu options; they premiered new arcade modes; Sakurai introduced a completely orchestrated soundtrack; the game even had a variety of computer animated cutscenes – largely a first for the series and the company. For all its efforts, Melee became the best selling game in the GameCube’s history. It's well worth noting that Super Smash Bros. Melee, for its impeccably complicated game engine, jump-started the franchise’s competitive streak. 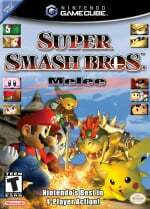 While Melee is no different from its predecessor or successors in terms of multi-player couch-co-op fun, those most committed within the fanbase soon developed advanced techniques in Melee that cement this particular title as the most demanding entry in the series to date. And despite existing in an era before online play existed, early organizations like Major League Gaming helped legitimize the competitive playstyle many Smash players still dazzle with today. What’s even harder to believe than this entry’s amazing sales numbers is the fact that series director Masahiro Sakurai had no idea it was being made until after the game was announced. For context, it's very important to denote the hardware Brawl appeared on. Seven long years would come to pass between Smash Bros. releases. When it was finally announced alongside Nintendo’s new console, it was the Nintendo Wii’s unique motion controller, not Smash, that took the world by storm. Today, the Nintendo Wii is as much a part of the fabric of its decade as music videos were to the '80s, or as Elvis was to the '70s. If you weren’t there, you still know a lot about it, and if you were, it's all anyone would talk about. Using a sneaky foot-in-the-door technique, Satoru Iwata, by then having ascended all the way to CEO of the entirety of Nintendo, announced the game to the public as a way to convince his old friend Masahiro Sakurai into helming the project. Sakurai quickly agreed out of a duty to uphold his stringent standards, opened an independent development studio, and began a long development cycle that would produce many firsts for the series: early online play, optional motion controls, and an out-of-this-world single-player experience featuring endless fan-favourite cutscenes. Not to be defined by simple iteration, Brawl featured another important, and at the time, highly unlikely series staple: non-Nintendo characters joining the battle. Did Solid Snake seriously just attack Mario?! 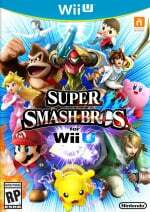 Items (like the newly introduced Smash Ball), stages and characters were serially announced on an official Smash Bros. website, the routine timing of which sent browser refreshing fans into a frenzy. This focus on adding more characters like Sonic the Hedgehog, Solid Snake, Metaknight and Pit greatly raised the total number of fighters from 26 from 37, and the number of stages up from 29 from 41. 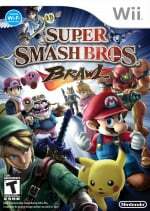 While the game would earn a reputation for being more accessible due to a toned-down game engine as compared to its immediate predecessor, the world at large didn’t mind; Brawl earned a top 10 all-time sales figure on one of the highest selling pieces of hardware of all time. Today, perhaps the most enduring of Brawl’s contributions to the series is its mind-melting soundtrack, a collaboration between 38 different composers (!) from inside the gaming industry, featuring over 258 individual compositions. The newest Smash Bros. game will theoretically always be the most technologically impressive. But depending on how you look at it, Super Smash Bros. for 3DS, the only Smash game to ever appear on Nintendo’s handheld line, might forever retain the claim as the most technologically impressive game in the series. In 2014, Nintendo was struggling. Its latest home console, the Wii U, was failing to gain traction and needed all the help it could get. Naturally, Smash Bros. was once again called off the bench. The tactic this time around? Nintendo went with its typical “everything-plus-the-kitchen-sink” approach, but hedged its bets by making two versions and marvellously making the core game work identically on 3DS as it did on its home console. Given there were now 58 characters to house alongside an improved online mode, it’s a marvel that the whole thing fit onto Nintendo’s pocket system. There were still, however, differences between both games. The 3DS title was released two months earlier to reap early adopter enthusiasm, and it featured an exclusive one-player mode called “Smash Run”. It also employed a sort of comic book outline style to go along with its literal 3D visuals on the 3DS screen. As a bonus, there were several stages unique to each version. Meanwhile, the Wii U version, of course, displayed at 1080p, a series first, and offered up a ludicrous 8-player mode, a barn-burning feature made easier by the fact that Nintendo created a plastic adapter that added 4 GameCube controller ports, a nod to its still growing competitive scene. Speaking of the competitive scene, Smash Bros. for Wii U not only sped up the gameplay from the previous game in the series, but Nintendo began marketing to the fanbase’s most committed players, arguably for the first time ever. This was punctuated by an event called the Super Smash Bros. Invitational, an ornate tournament featuring over the top spectacle, (relatively) tournament rules, and most importantly, actual professional Smash pros alongside Nintendo’s creators. Statement made. This is the note Smash 4 will be remembered for as a whole. It trended the series towards modern gaming conventions like esports, online ballots, game patches, downloadable characters (including the ever-popular Cloud from the Final Fantasy series), and a greater emphasis on online interactions. Combined, both versions sold well, the 3DS version carrying much of the slack en route to becoming a top 10 3DS game by measure of sales. The Wii U version, meanwhile, sold admirably, considering the very low adoption rate of the Wii U console. Yet it stands to remain the lowest-selling console version of Smash Bros to date. Between the release of every Smash Bros. game, opinions differ over what modes or characters should remain, what options are best, and what stages are optimal to fight on. “No more,” presumably thought series director Masahiro Sakurai. The fifth and latest game in the series, announced in March of 2018 for Nintendo’s rebound system, the Switch, would settle for nothing less than conglomeration. The philosophy of Super Smash Ultimate is right in the name: be the Ultimate title in the entire series. But how can Nintendo possibly hope to top 20 years of video game mascot royal rumbles with certainty? For starters, every single fighter who has ever been in a Smash Bros. game is back in action. That means 76 in total, every single one updated, including an assortment of fan-favourite newcomers (with more on the way). Nintendo made sure to offer unprecedented customization options, along with extremely malleable modes and customizations to appease even the most hardened Smash connoisseur. And outside of Super Smash Bros. Melee, the game is the most fast-paced in the series, with a strong nod towards “east to pick up, difficult to master” game design. Being this is truly the first Smash Bros. game to release in the YouTube/Twitch era, the results have been fascinating to watch. And to top off the whole package, this behemoth of an experience can be brought on the go, thanks to the Nintendo Switch’s portability. Having a home console experience like Super Smash. Bros Ultimate on a bus is frankly hard to believe, until it's in your hands. But why is Nintendo keen on having a massive blow out for this Switch edition? Well, Sakurai has hinted this may be the last Smash Bros. game in the series. But don’t worry, Smash fans; far more realistically, Ultimate is potentially the last Smash Bros. that Sakurai opts to direct. And if indeed Super Smash Bros. Ultimate is the last game Masahiro Sakurai creates himself from the ground up, it will cap off 20 years of one of the most improbable creations in all of gaming history. That is to say, Super Smash Bros. is not only a genuine original, a meticulously balanced title in the face of thousands of permutations, and a standard bearer for how licensing in a video game can work, but every single game in the series, to their absolute, purest core, is nothing more than the exquisite execution of a really dumb question: Who would win in a fight between Mario and Link? Hate to say it, but the answer twenty years later is pretty obvious: everyone wins. Thanks to Source Gaming for a few key translations of Japanese text. Honestly, I believe if it wasn't for the nostalgic fandom of Nintendo characters, the game would have not gone anywhere. Multiple companies have tried to replicate it (and some very well at that) but they can never gain a decent amount of traction with original characters. Almost every "successful" alternative has some level of cameo appearances that helped spike its own popularity. The genre is just so hard to be hooked on unless you have some form of investment from an exterior source. It's what made Smash... Well, Smash. And even though the arena fighter genre existed before its inception, Smash made it Smash. Smash defiantly knows how to keep people invested. I've dumped so many hours into these games over the years its insane! While the novelty of the crossover element has long worn off, (after Sonic and Snake were revealed in Brawl, anything was possible) the base formula of the game continues to hold strong. Each entry in the series is still fun to play despite all the downgrades, with many STILL prefer Melee to anything else. I'm interested to see if Ultimate ends up getting new game modes in the DLC packs. I really miss Homerun Contest. Maybe even a full on paid Subspace sequel, similar to Splatoon's Octo Expansion. But I'm totally ready for a nice long break before the next full entry in the series. I'd press F to pay respects.. but I just respect it. @Paraka I don’t think it’s just nostalgia though, but also just the general love of Nintendo characters. It’s ironic because most Nintendo characters are silent protagonists and even villains, but Nintendo games tend to inject so much life and character into their characters. Mario and Link haven’t really said much of anything in their history (not counting cartons and movies), but you can still figure out what their personalities are due to the way they design their games. Compare this to other studios and the same can’t be said, or at least the personalities aren’t distinct. PlayStation tried it with All-Stars, but a good amount of those characters have no personality or bland personalities, which is a result of most “realistic” games, which is what other companies mostly put out. Hell, looking at Smash, the least interesting characters are often third party or Fire Emblem. What elevates them is getting drop kicked by Bowser and hooked with a fishing rod by Isabelle. When Smash 64 hadn’t dropped yet, for some reason people didn’t make a big deal out of it. Nintendo Power April 1999 had Smash Bros relegated to the corner in favor of the timelessly impactful Beetle Adventure Racing. Too bad we never got Dragon King: The Fighting King. I'd totally play a game where every character is a Captain Falcon rip off. Smash Bros. Is absolutely insane. Seeing Mario, Sonic, Snake, Megaman, Pacman, Ryu, Cloud, and Simon Belmont all fighting each other in 8 player Smash is something that shouldn't exist. But it does. @ItalianBaptist - I love this footnote. The first place I had ever heard of Smash Bros. was that very issue of Nintendo Power, and my friends and I freaked the eff out. So, street smash on the 3ds is basicaly automatic Ohajiki. I always wondered what were they thinking with that mode. @caljr_8760 - That love comes from nostalgia. It's fine, nostalgia isn't a bad thing. The gaming community just seems to saturate the stigma that nostalgia is bad because you liked the old when you were younger. Nearly every game featured in Smash is nostalgic to us, cause it has roots, it has history in our childhoods. Wii Fit Trainer isn't nostalgic, but she is tied to so much that is, which makes even her feel like an icon. There is reason we love these characters, and much of it is for the similar reasons you already listed. Sony's Smash was horrible because they actively took characters with "edge" and attitude, they see themselves as the "mature audiences console" in their own company and that game is exactly the example needed to show this. @AlienigenX - In order to get this DOWN to 3,000 words, yes, footnotes like how Street Smash was basically a nod to the series' origins were cut out. Good eye! smash was a culmination of well known first party characters mixed with third party and mii that you can create. These games will last a lifetime. Smash is probably my favorite franchise of all time. It’s incredibly fun and addicting, and it features an eclectic cast of gaming’s finest (and Corrin 😜). Every new character brings something exciting, even if they are an Echo. Honestly, without Smash, I wouldn’t have experienced many fantastic franchises. The first Smash game I played (Brawl) introduced a younger me to Zelda, Wario, Kirby, Pokémon, and more. Brawl convinced me to try Kirby Super Star Ultra, one of my favorite Kirby games, and Pokémon Black, my first ever Pokémon game that made me fall in love with the franchise. I probably never would’ve played EarthBound, Metroid, Star Fox, Punch-Out!, Wrecking Crew, or Metal Gear Solid if not for Smash. @MH4 This reminds me of something that happened last week. I was playing Gangplank Galleon on the bus and someone was trying to insult me because I heard of the song thanks to smash. Whoever did that arrangement is a legend. How much would you guys recommend SBU for the single player and online only – no local? My friends, predominately, just don't do video games. @MH4 - I think Smash cannot last without all the other series represented in said game continue to grow. Smash is great, but it actually makes me appreciate games Nintendo makes much more. WAS...the ultimate fighter. Imo smash ultimate is overhyped. i do not like how the smash ball attacks are cut short and all have the same initial flashy effect. Honestly ultimate feels a little less ultimate and a little more quantity over quality. atm ill play the wii u version for now, and wont be buying a switch for JUST smash or even at all for smash. its very much a dumbed down port for me. minus the new characters. i honestly had more fun with my hero one justice. @brunojenso Seeing as how local is the lifeblood of Smash in my opinion, I’d give it about a 7/10 for just online and single player. There’s over 1,000 spirits to collect, but it can get repetitive. Online is okay. A bit laggy sometimes, but otherwise good. I’m just glad directional air dodges are back in Ultimate. Really missed it in Brawl and 4. @Paraka Exactly! The different series that are represented not only help make Smash more interesting, but it helps preserve them and introduce them to younger generations. I wouldn’t know who Lucas (my main), King K. Rool, the Belmonts, Snake, or literally any of the FE characters are if not for Smash. It’s really a win-win. More franchises are represented, making Smash more interesting, boosting sales, and keeping those franchises fresh in peoples’ minds. Smash Ultimate is my favorite of the Smash games. Heck, it is my favorite fighting game of all time. The World of Light mode is my favorite 1p of all time in a fighting game. Online is fun too. I won 2 out of 3 matches the other day. I love it! @MH4 - Neither of the Belmonts? Really? You're one of the first who didn't know Simon (Richter on the other hand got severely overshadowed due to Alucard being a thing). And Nintendo just keep growing, during the Switch alone they got 4 new IPs made (ARMS, Snipperclips, Flip Wars and Sushi Striker) And two of them have a little fanbase who wants more of them. It's really just something. I honestly do not think Sushi Striker would have such a cult following (small, but vocal) if it wasn't for Smash existing as a thing that could warrant better representation as such. The idea alone makes some characters just more popular. Demiru is another prime example of that, and so is Sukopon. Smash inspired me to play Castlevania on both my NES and SNES Classic, and now I like the franchise quite a bit. @MH4 - Fair enough. He was always THE Belmont to me. @Paraka Another factor in me being interested in Castlevania was this video. It’s part of a series of parodies of different franchises, mostly Nintendo ones. @MH4 - Hey I remember that animator, saw his Smash stuff spammed all over the place. Not a fan of his sound quality but is goofiness get some smiles from me. I am a Carbot guy, shame he doesn't do Nintendo stuff. I've only played it solo and until World of Light was over I'd given it a 9/10. After that I went and finished the adventure and spirit board Challenges. Now I don't have much to enjoy but still come back for some reason (gotta catch 'em all ). Right now it's a 7/10 for me in enjoyment, but overall score would be a 9 still considering the mileage I got out of it. If I could get some friends to play it, enjoyment would go back up to 9 or maybe a 10. Thanks guys, very helpful info - appreciate it. I think I'll get it physical, enjoy the campaign and decide then if I want to keep it in my collection long term. In general I quite enjoy fighters solo anyway. Ohajiki sounds A LOT like Street Smash. @Paraka I disagree. The gameplay has nevee been properly duplicated. Smash Bros. plays like a dream - immediately accesible yet has incredible depth. Playstation All-Stars and Dreamix TV World Fighters are pretty bad, and do solely rely on the nostalgia you talk about. Brawlout seems to have gotten some traction, but without any heavyweight licenses and a few indie characters post-launch, it's proving that it's the gameplay that makes a fighter truly succeed. @Spiders - Brawlout, Brawlhalla and Rivals of Aether are all pretty well tuned in terms of gameplay, even RoA says it's practically 2D Smash in some groups. Brawlhalla and Brawlout both saw notable spikes in playerbase when other indies came into play. The gameplay itself does not grasp players alone so well. Even though I believe it is a fun, accessible genre. Even earlier adaptions to the genre like Custom Robo and Powerstone couldn't gain traction, Smash took the genre and defined it as... Well, Smash. Nintendo is the old Disney (back when they were good) of the video game world. I still get impressed when I see numbers from the Wii era. What that console sold both in number of consoles and games is out of this world! We've been playing Smash Bros since Nintendo 64 (not sure if the N64 was discontinued at the time), But, i do remember receiving Smash 64 as a gift from one of my family members. me and my brother had a blast playing it. I owe so much to Super Smash Bros. Had it not been for my introduction to the franchise, I would have likely never had any exposure to the Mother series. EarthBound is my favourite video game, and yet I owe my love for the game to Super Smash Bros., which helped bring it and many other obscure franchises to the attention of so many. I will forever be grateful to Masahiro Sakurai and Satoru Iwata for bringing Super Smash Bros. to where it is now. With the series being so firmly established now, it's easy to forget how odd the name 'Super Smash Bros.' is. Smash Bros. Ultimate is stunningly phenomenal what a great game to just get lost in and have a good time by yourself or with friends. I would even go as far to say that Smash Bros. is the most important fighting game series of the last twenty years by a large margin. @Desrever., That is a great idea getting a paid DLC Subspace addition I would so totally purchase that it would be freaking awesome to play through another Subspace mode especially with all the characters that are in Smash now. It is hard for me to believe that Nintendo has not at least thought about it, Subspace was and is easily one of the most favorite modes to ever be in a Smash Bros. Title. I remember being in my teens, buying a crazy game with Mario and Samus on the same cover. That's the reason I got it, I saw Samus and being the huge Metroid nerd that I am, I thought that was the closest I could be to having a Metroid game on the N64. I got addicted to that game. Me and my buddies would spend countless hours playing. I know a lot of people discard that first game for being so basic, but I honestly haven't enjoyed any other more than the original. It was timing, just before going to college. I still keep my copy in great shape. @PKBegley., I read your comment and thought that is so true I would most likely have never played a Fire Emblem game if it was not for Smash Bros. and now I love Fire Emblem hands down my favorite strategy game series and Smash Bros. is the reason I played a Fire Emblem title I was curious about Ike and the series he was from. @brunojenso personally, I think the online works great. I have pretty good internet and don’t get any lag in it except when the opponent has an unstable connection (due to matches being P2P and not on a server). When that happens, I just don’t play with that person again. Aside from that, online play is very smooth! @Paraka You're right. It lives as well as it does because the format itself is thin and it breeds fans because of the IPs it picks up, primarily Nintendo but when you throw in some Konami, Capcom and Namco gems people go nuts. Ultimately the game is an arena brawler, not even an actual fighting game. It's in the same family as Capcom's Power Stone titles, and the 2D Jump Superstars games with all the manga/anime characters. The core format is sound, thin, but sound, works fine for a time alone, but with friends in a party environment it can last ages longer. You strip Smash of the Nintendo crew, and you get a pretty common arena brawler that has been around for a very long time. Faces of favorite games did it, something even Sony bombed at on PS3/PSP with their same-y fighter. Sorry but this game is no ultimate fighter, it's an ultimate Nintendo fan service arena brawler but that doesn't make as pretty a headline. @WinterIceFox i generally like all smash games and buy the next system soley for it. However trying this one out at a friends house. it just didnt feel different enough to make it worth a purchase imo. After about 10 mins of play, just kinda lost interest, which never happens with me and smash games, though i only got to play multiplayer with like 5 others. it needs more freshness and less of a porty feel, at least for me to get pulled in. ill probly still play it if im with friends who own it, but i wont be purchasing it until the wii u one gets tired for me lol and i feel ultimate is ready for me. Theres like 20 other fighting games id rather play that i think ill enjoy more. Now if they add more interesting characters in the future, i might buy it.. RWBY characters though itll never happen, would make an insta purchase for me, or at least swayyy me greatly toward owning it. Melee, the game Smash die-hards swore by for years, sold barely more than half as much as Brawl, the game I have seen hated on for years? @Paraka It's possible it would likely not have hit the same level of popularity it has now were it not using Nintendo characters. That's the power of branding and marketing, after all. However, from a mechanical / gameplay perspective though, I'd say no other game of this style (All Stars, TMNT Smash, etc) comes close to the gameplay control polish and fun of the Smash Bros series. The simplified controls, 4 players fighting simultaneously, and % and essentially being a mixed genre (platformer fighter) all made it unique and special. Watch some competitive smash play videos, and all the advanced mechanics (L cancelling, wave dashing) also created a lot of depth/replayability in the game and sparked a lot of interest from the fan base. @ItalianBaptist Smash 64 still had one of the best video game commercials ever made to help spread the word, though. While Ultimate did bring back every fighter (and more) and almost every stage, I do wish they had brought back custom specials, Event Matches, and the Stage Builder (the good one from Brawl, not the lousy one from Smash 4 Wii U that requires artistry to make any platforms.). It's just not completely "ultimate" without those features. (The home run contest would've been nice too, although not as necessary as those other three features). Oh well, at least we got an awesome single player adventure mode and offline tournaments after they weren't included in Smash 4, while online play FINALLY lets us play stock matches without needing to jump through a bunch of hoops. @Paraka My heart hurt at the mention of Custom Robo... I love that game, but I think it's hurt more by it'd awful Pokemon-esque RPG element, with the entire world solely serving to talk about Robos. Thing is, I don't even disagree with your point about nostalgia and strong IP, but I don't think it would sustain 20 years if the gameplay wasn't superb. Can we agree plauers may come for the characters and stay for the gameplay? Woah, a lot happened last night. @Spiders - I can defintiely agree, but... Halways-ish? Smash is the game that attracts so many because of who's in there. I'd be blind and dumb for not believing if someone liked Metal Gear looked into Smash cause Snake can break Pikachu's neck. The gameplay is tuned to be accessible, so when people come, they're not punished by Pikachu for attempting to break said neck, you grasp it pretty quickly. Because of that, draws more in to try it for similar reasons. And it'll likely grow with Persona (look at reaction videos of non-traditional Nintendo players). And if rumors are to be believed, likely will happen if Minecraft is in Smash. Like I said though, there are others that are fine-tuned like Smash, and the genres didn't become so big till then. And Smash was so influential that not one game is an Arena Brawler, but a "Smash Clone." Give or take the negative notions of such a statement. Smash wasn't this because of gameplay alone, it was a staple that made the genre its own, and named it after itself ultimately. And many players want to champion their favorite characters. How many people have you seen that want to be the best Ridley now that he looks like a frightened potato to be playable? @DeltaPeng - It is Nintendo, so even if it was just its own, non-invasive IP, it'd likely be popular. However, as I stated in other responses, it would likely not have made such a defining example of the genre. Rivals of Aether has always been toted about to be the closest to Smash as you can get without being Smash. And even that... Honestly not many recall it even talking about Smash Clones. It's often either the most recent one, ones with guest characters, or the horrible mistakes. I believe the culmination of Nintendo's history is what made it so effective that it's no longer Arena Brawler, it's Smash and its clones. The sheer existence of Smash as it is now is actually effecting their other games as well. I cannot believe games like Sushi Striker, ARMS and Rolling Western (shame I cannot say the same for Codename STEAM) would have as many people trying and talking about it if it weren't for a fan of one of those games making a Smash roster discussion about them. Even then, we also have people growing interest in Demiru (Tomato Adventure) because of a trophy, The Last Story characters because of stickers, and ultimately we would likely not seen such a meme-worthy effectiveness of MOTHER 3 being localized. All of that is because Smash is what it is. @VmprHntrD - There was so many that came out before it and after. What's funny is even among those fond of the games (RIP Custom Robo), it's hardly spoken about expect the, what? 2-3 people per forum if one of them brings it up? That's how well received such a genre was, it could be great, but it would never be what Smash eventually made it to be. And two of the greatest replicas of Smash style play are Rivals of Aether (so I am told, never played it, but the community makes me believe this is likely) and Icons (which is defunct). Neither of those games got the popularity like Smash. Even Brawlout got more recognition when they added Yooka-Laylee, Dead Cells, Hyper Light Drifter and Guacamelee characters. @Paraka Well, I guess in part it depends what kind of gamer you are, any game that plays like Smash does (and does it well) is a win in my book. I'm more about the mechanics of games though. It is hard because the movesets of the characters were based off of the characters themselves. Had generic characters been used, perhaps the characters movesets would have been different and not as unique. As long as the characters weren't overly bland, and again, if it had the opportunity to be in the spotlight, I think smash would've done great on mechanics and idea alone. For one, Smash 64 is a blocky mess in terms of graphics, but it plays better than a lot of other games do, in general. This was a good read. Growing up with the series since the original smash to where we r now with Ultimate....WHAT A RIDE!!! Smash Bros is a special series that celebrates gaming a in way that other games cannot do. I didn't know the game was based on Japanese marbles. So that's why there's a "disc-minigame" in Smash 4!